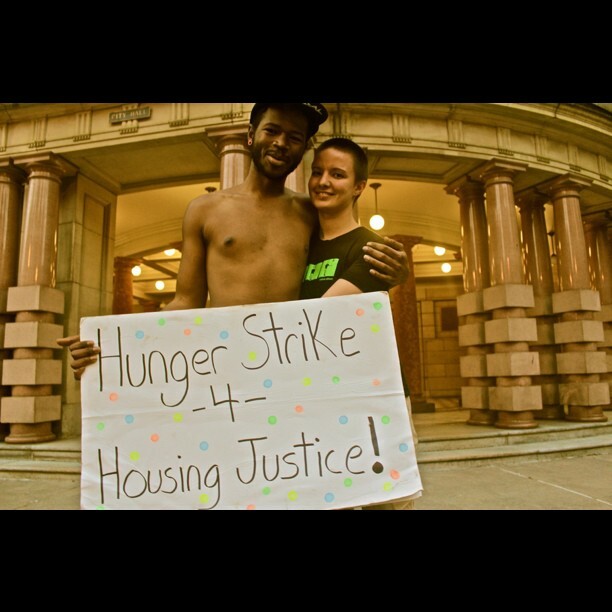 More than a month into his hunger strike, Cameron Whitten has maintained his campaign against housing injustice for longer than many people probably expected. But then Whitten has never been one to bend to conventional expectations. The former mayoral candidate is using his Occupy-backed celebrity to draw attention to homelessness and call for housing justice. And attention is what he’s getting. He has been camping outside City Hall since early June, and has attracted followers to his cause, using the stage to talk about the issues. He has three requests of the city. The first is to withdraw the fines against the owners of the lot leased by Right 2 Dream Too, a homeless overnight rest area. The city is fining the owners more than $1,200 a month for code infractions. The second request is the put a housing levy measure on the November ballot, something the city has abandoned in the wake of other failed levy attempts. The third request by Whitten is for the Multnomah County Sheriff to issue a one-year moratorium on home foreclosures in the county. In varying form, all of these concerns have validity. Right 2 Dream Too needs support, not sanctions. The foreclosure crisis has devastated families, and the city has to find another, sustainable funding stream for low-income housing. While several city commissioners, including the mayor, have talked with Whitten at his 24-hour sidewalk camp, they have shown no signs of moving forward to accommodate his requests. But something else is happening here. You can fault him for not having the answers to the problem, or using tactics that you might not agree with. But who among us has the solution we all want to hear? Neither passersby nor the occupants of the corner offices in City Hall have put forward definitive answers to the constant stream of people hitting the streets. Despite Portland’s progress in getting people into housing, getting people sober, employed and off the streets, our ultimate success is undermined by economic stagnation, joblessness, housing costs and regressive attitudes toward people who are down and out. Our response as a city is measured more by how we react to this landscape than our ability to change the landscape altogether. Whitten’s response is to rebel against the shoulder-shrugging resignation of another summer with homelessness. It’s not about the list of unmet demands, or the sideshow atmosphere that flares up around these kinds of campaigns. It’s about presence — and sacrifice. This effort, and the many before it, remind us that behind the rhetoric on homelessness and intermittent coverage in the media, there beats a real passion to call out the injustice in housing, and work to improve the lives of people who lack shelter, safety, health care and hope. It takes community to bring it all together, and that’s what Whitten is building — through social media and in the press. People are talking, and even that helps move the ball forward.